To mark the historic papal visit of Pope Francis to the City of Philadelphia in September 2015, CMC ENGINEERING was commissioned to design and engineer a donor recognition garden at the iconic Basilica of Saints Peter and Paul. The inspired design was intended to become a symbol of the monumental papal visit and to recognize the donors who generously contributed to the World Meeting of Families Conference and Papal visit. 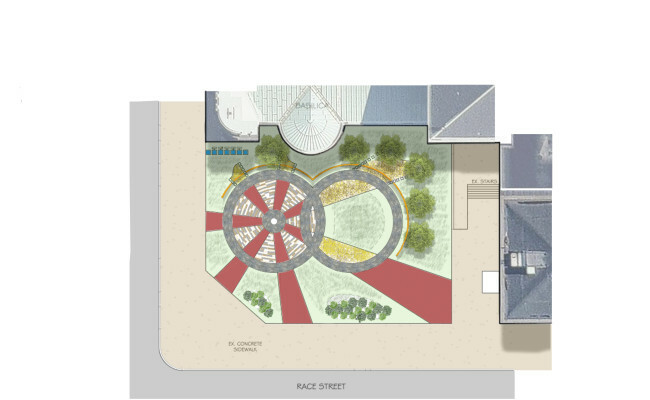 The thought-provoking garden design highlights and praises the family union with sacred symbolisms of varying levels. Sculptural elements amid dramatic pedestrian walkways and lavish gardens, infuse vibrant colors into this highly visible center city urban space.